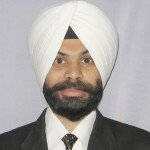 Assistant Professor at Sant Longowal Institute of Engineering and Technology from 09-10-2006 to till date. Singh, Manminder, and A. S. Arora. “Face Recognition and Face Liveness.” Research Cell: An International Journal of Engineering Sciences, Issue 10 (2014): 2320-0332.
, Manminder, and A. S. Arora. “A robust anti-spoofing technique for face liveness detection with morphological operations.” Optik-International Journal for Light and Electron Optics 139 (2017): 347-354.